When it comes to fashion, what we choose to do is often impractical. For women, there are tons of examples. But for men, one stands out: the necktie. At some point in human history, someone decided to tie a noose around his own neck, leaving the other end to flap in the wind — and he called this high fashion. And other people agreed! And then more people agreed, and ultimately we reached a point where if you wanted to be taken seriously, a guy had to strangle himself ever-so-slightly with an expensive piece of fabric. And to do it right — Windsor knots are complicated! — that meant we had to practice this self-flagellation. It’s lunacy. Blame a boy-king. And France. When we think of the fashion capitals of the world, Paris is most definitely on that list. Credit for that goes to King Louis XIV, easily longest-reigning ruler in that nation’s history. Louis XIV sat on the throne for 72 years (figuratively) after coming to power at the age of four in 1643. For much of his childhood, his regnal power was vested in a group of stewards (his mother, despite his late father’s wishes, leading the way), but the nation saw him as its rightful leader anyway, certainly in the future if not immediately. By the time he reached his late-40s, the long-ruling monarch exerted a significant amount of influence throughout France and beyond. When Louis came to the throne in 1643, the fashion capital of the world wasn’t Paris, but Madrid. [ . . . ] French aristocrats imported their fashions from Spain, they bought their tapestries in Brussels, their lace and mirrors in Venice, and their silk in Milan. They didn’t have much choice; France simply wasn’t producing luxury goods of a comparable quality, and it didn’t have the political, economic, or cultural clout to dictate fashions to other countries. Louis XIV set out to change that, and, over the course of his long reign, he succeeded brilliantly. Luxury was Louis’s New Deal: The furniture, textile, clothing, and jewelry industries he established not only provided jobs for his subjects, but made France the world’s leader in taste and technology. His shrewd finance minister, Jean-Baptiste Colbert, famously said that “fashions were to France what the mines of Peru were to Spain”—in other words, the source of an extremely lucrative domestic and export commodity. Louis’s reign saw about one-third of Parisian wage earners gain employment in the clothing and textile trades; Colbert organized these workers into highly specialized and strictly regulated professional guilds, ensuring quality control and helping them compete against foreign imports while effectively preventing them from competing with each other. Nothing that could be made in France was allowed to be imported; Louis once ordered his own son to burn his coat because it was made of foreign cloth. It was an unbeatable economic stimulus plan. As a side effect of this boom, Louis XIV became the king of fashion — whatever he wore, others were destined to copy. And his tastes were influenced by experiences from a very young age. The uniforms featured a cape-like cloak, designed to keep the mercenaries warm as needed. And they kept their cloaks on by tying one end around their necks, in a practical but ornate bow. Per TIME, Louis XIV, having seen men in his father’s service wearing these ties, adopted the look for himself a few decades later — just minus the cloak. And with that, the tie was born. As the Washington Post explains, “Parisians quickly translated the Croats’ scarf into a new clothing accessory,” calling these new accessories “cravats,” derived from the French word for a Croat, in reference to the men who first donned them. With Paris the burgeoning capital of the fashion world, what happened in France hardly stayed there. 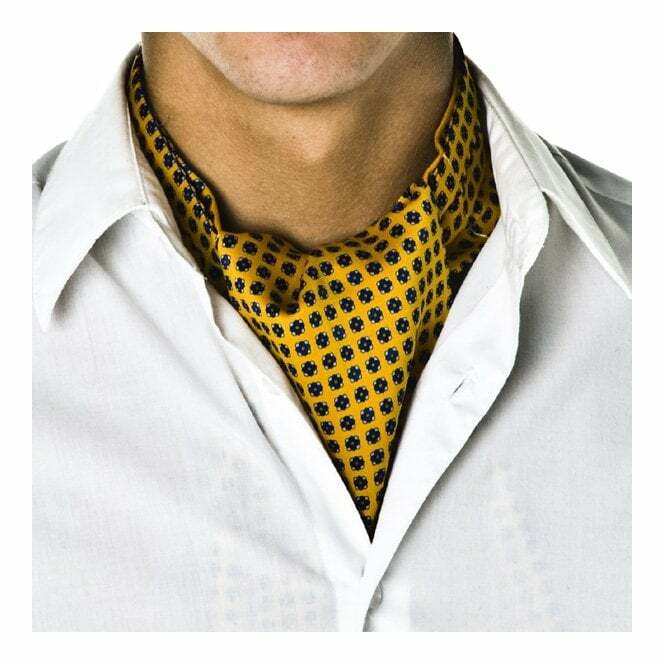 Elites throughout Europe began donning cravats and before long, they became a staple of men’s fashion around the continent. And as Europe’s influence grew beyond its borders, so spread the expectation that men wear some sort of visual flourish around their necks. Today, the term “cravat” is still in use, a word we still use today to describe these original neckties (an example of one can be seen here.) Since then, the tie has become less ornate, becoming thinner and longer. But unlike the original ones worn by the Croatian mercenaries to keep their cloaks on, they’re also a lot less practical. Bonus fact: How many different ways are there to tie a tie? That’s debatable. According to some fancy math done in 1999, there are 85 different ways, as reported by the New York Times. (The article is really interesting if you want to understand the mathematical theory, but it’s a bit dense for here.) But that, according to a separate team of mathematicians, depends on how you define what a “tie” is. Inspired by a reverse-tied tie from the movie The Matrix Reloaded, an example of which can be seen here, that team used a broader definition. In 2014, the second group of mathematicians concluded that there are 177,174 ways to tie a tie. From the Archives: No Necks Allowed: The incredibly practical reason why Fred Flinstone wears a tie.